Winters Flat Primary School, Castlemaine, opened on its present site in 1964. 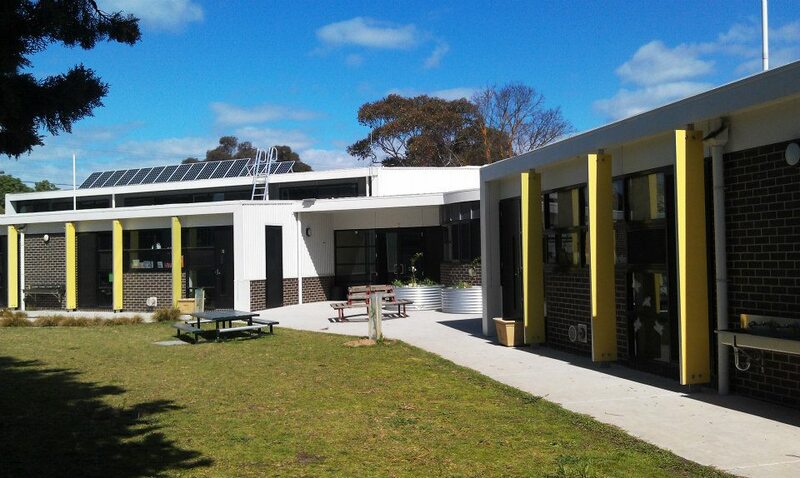 The school is located on the western side of Castlemaine on an attractively landscaped site. The spacious grounds are within sight of the natural features surrounding Forest Creek. The school provides a natural, traffic free environment in what remains an urban area. As well classrooms, our school has a purpose built library, Art/Craft room, a converted multi-purpose gym, performing arts area, commercial kitchen (Oak View). We have two playground equipment areas as well as a large oval used for sporting and lunch-time activities. "Creekview" school building (pictured below) was opened in 2010 and provides six classrooms with open areas, staff offices, two kitchens, indoor toilets and withdrawal spaces. It is complemented by a huge timber deck for outdoor activities. At the beginning of Term 3, 2018 we moved into our refurbished building at the front entrance to the school, which accommodates our administration block, teachers' workspace, sick bay and senior student’s classrooms at the rear end of the building.